Two years ago, Antony Lavelle released Upgrade Complete. A mix of shoot em up and Space Invaders, the games main purpose was to unsubtly parody one of the more obnoxious aspects of modern gaming: the inclusion of unnecessary and convoluted upgrade systems. Everything came at a price and had to be bought: weapons, graphics, music, buttons... even the pre-loader. However, if Upgrade Complete was meant to be scathing indictment, then it was kind of a failure: it turns out that watching a game reconstruct itself from amateur-level to professional was quite engaging and, combined with the solid gameplay, made for an experience voters found worthy of a 2009 Best of Casual Gameplay award in the shooter category. However... it turns out that the developers weren't quite done... After all, what is an upgrade system without a sequel that requires you to start your progress from the beginning? Thus comes Upgrade Completer a game that advances the original's premise as much as its technology, no joke. 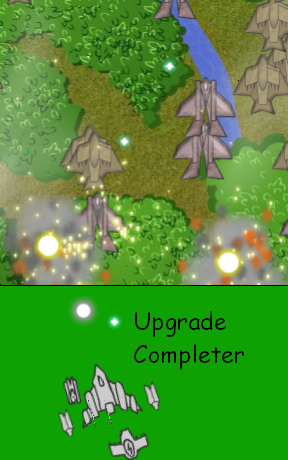 Upgrade Completer plays much the same as the original: using a combination of the [arrow keys] and the mouse, you speedily guide your plane across an enemy landscape, blasting everything in your path and collecting the credits that are released from the wreckage to upgrade the fighting power of your ship... and everything else in the game. And I do mean everything. Backgrounds. Weapons. Clouds. Flash Quality. Copyrights. Dead Pixels... everything is up for grabs. 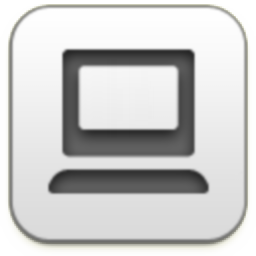 Want the interface to be nicer to you? We can arrange that. Want some voice acting from the likes of Egoraptor? You've got it. Want access to the even-more-satirical Indie or 3D modes? Sure. There's a hilarious amount of stuff to unlock, and it's all yours... if you have the credits. However effective, If it was only a parody, Upgrade Completer wouldn't be worth a second look. However, there is quite a solid base underneath its initially terrible exterior, and its wonderful to see the reinvention of an interface with a click of a button. It's like going through a history of the possibilities of flash gaming from the primitive MSPaint works of years past to the artistic and technical glories of the near-future. Of course, most of the upgrades you buy do quite little: after all, this is still a game that parodies needless unlocking and arbitrarily hidden content. But by the time all the upgrade boxes are filled though, you'll marvel at how far the game has come, and as such, how far flash gaming has progressed as a whole. In the end, however Upgrade Completer may be based around a single joke, it's a good joke and remains humorous even as the concept is taken to its absolute limits. I do have some general nitpicks about the specific mechanics of the shooting interface and the ship editor, but they almost seem beside the point. You shouldn't approach this game as a shooter, but as a commentary on upgrade systems, and how often they serve only to make a game easier just as you become skilled at it. Now, if you'll excuse me, I've got some premium JiG content to upgrade. Note: Please be warned that upgrading BPM causes the game to release a flashing "screamer"... i.e. loud noises etc. that will indeed cause the heart to pump faster. Though I generally enjoyed UC, I consider this to be a nasty joke, and think it fair to warn people in advance. Upgrade Completer Walkthrough now available! The game does autosave, so you can safely exit the page and return. To complete a wave and progress you must destroy every enemy. You get more money from coins if they have been falling for less time. Also, enemies do not hurt you directly. As such flying at the top of the screen or in groups of enemies will get you a lot more money than sitting at the bottom. Early on you should spend most of your money on upgrading your ship, so you earn money faster. Some upgrades are obviously essential to get playing at the start. They are: UPGRADES! 1, Exit Upgrades, User Interface 1, HUD, and Play Button. Most other upgrades are superficial and don't make much difference to the actual gameplay. Upgrade your ship parts to get the most out of them. Make sure to get both foil and boost modules to improve maneuverability. Magnet modules are very useful for getting more money; I recommend getting at least one fully upgraded. Other than that, just blast away with as many guns as possible. You can use as many as you can fit on the grid. Rockets and lightning are particularly good as they automatically target enemies, even if they're partly offscreen. I have to say, the review did not completely cover the location of this "screamer". For all the squeamish (me), you might want to minimalize that browser window before upgrading "BPM". Of course, being the coward I am, I daren't get back to the game now, however fun it were and however badly the screamer was made. I still give it a full 5 mushrooms, as that is approximately the multiplier applied to the amount of upgrades. I had the same problem, trollface. But restarting fixed it. I think the screamer is released when you reach a certain percentage, not any individual upgrade. Sad, I hate to see this kind of random trolling in such a good game. It's the only one I've seen so far, though. Never mind... I just got it... The BPM upgrade increases your heart-rate... By shouting at you. I know this is a dumb question, but... does this game autosave? I want to take a break and I don't want to close it if it'll erase all my hard-earned progress. Restarting didn't fix the fullscreen issue for me, but restarting, playing the game in windowed mode and going to fullscreen mode during gameplay did. The premium content to totally worth it. I don't want to be too negative about this. This is still a cool idea. But it's disappointing that none of the upgrades actually improve anything. The sound effects start out as cheesy (but kind of charming) voice work, and upgrade all the way up to cheesy cliched shooter effects. The avatar starts as a boring little blurry guy and upgrades into a terrible alien thing. The voice work starts out as cheesy and funny in one way, then upgrades to being cheesy and funny in another way. I guess the intention is for the game to "upgrade" without anything actually improving, to satirize how upgrades in other games don't really improve the experience either. But what's the point? This would be so much more awesome if you could actually upgrade it into a good game. I missed the Lagtastic and Totally Worth It medals. Anyone know how to get them? And I've collected more money than fits on the hud -- I guess the intro wasn't serious about repaying? I just figured that would be another easter egg trigger. I'm having trouble with the last boss. I've filled every available spot with missiles but it's not enough. Any advice? Yes, the game autosaves. But since you asked that an hour ago I'd guess that's moot, heh. Well, if anyone else wants to know, it does. For Lagtastic, turn Indie Mode on for a few seconds. For Totally Worth It, fully upgrade the Premium Content, go to the main menu and click the Premium button, then click the Give It button and enjoy it. All of it. Geez, what a jerk for including that heart rate bpm upgrade. I was in the middle of thinking, "Ya know, that upgrade's probably going to startle me, better turn down the soun-OH MY DEAR AFSDLFJDF!!" I got the lagtastic medal by playing in 3d and indie mode at the same time. AAGH WHAT THE HELL the increase BPM was... ugh. Screamer? Really? "Lagtastic" or "Totally Worth It" medals? Best upgrade ever: Indie Mode! Dave Lopo: In the upgrade menu is an option for UPGRADE BPM priced at 1 dollar. Buying this upgrade will trigger the screamer. about 4-7 seconds after buying the upgrade (as soon as you buy a different upgrade? ), a loud constant scream will sound, and an angry face will fill the game screen and will flip between having a greenish color palate and a blueish one. after it disappears, the game will give you the achievement "Saw it coming"
Gah! sorry, I meant "upgrade heart rate". that is the one that triggers the screamer. I got mixed up with the description of it, which says "upgrades your bpm." Well hey, it was released on April Fool's Day. Of course it would have SOME prank. A couple of rocket launchers, about six or seven lasers, and about a dozen bomb chargers. Everything fully upgraded. Focus all lasers on the boss, and hold Space so the bomb will go off as soon as it's charged. Keep all your focus on the boss, and try to float on top of it so all your bomb shots hit it. With this, the boss exploded just before it left the screen; I'm sure with more lasers it would take a shorter time. 1) My save file vanished. I have to start over, and I had a good few upgrades, too. And it WAS saving, as it disappeared after about the fifth time I came back to the game. 2) I don't think the magnet works. At all. Even upgrading it does literally nothing. The coins don't come to me at all. At least it worked in the last game. The magnets do work, but even fully upgraded they're weak. You have to have several of them to get a good pull. Damn. I couldn't fill four squares on the ship upgrade screen, and now I honestly feel incomplete... Need to upgrade!!! Waow check out that sheep man! Hasn't anyone noticed that JIG is not pranking us this April Fools? I think you may have missed one of today's posts. Heh, love the nod to FF8 in indie mode. I'm having the opposite problem from Wolfgang -- I don't want to save. I've deleted cookies, history, everything, and I can't seem to start fresh. Boo hoo. It's going to take forever with this yucky ship design to get enough coins to buy more upgrades so I can make a better ship. My boss strategy was 6 rockets, 34 lasers, 18 bomb chargers, and 20 magnets (for max moniez). All was fully upgraded. I just held space and held mouse on the boss and he died in 30 seconds. My ears still hurt from the BPM upgrade. Never playing anything from these guys again. It needs a fun upgrade, too. What a complete waste of time. After a friendly warning from Tricky in the review, I expected it, so the heart rate upgrade didn't make me startle. What I didn't see comming was indie mod which made me LOL hard. Charming game! Deserved its 5 mushrooms. Which wave is the boss on? I love how my ship filled literally half the screen while I was fighting the boss. And of course I also loved the upgrading system. But what did the OCD upgrade do? Isn't the name of this game "Upgrade Complete 2"? Not "Upgrade Completer"? I liked the previous version of the game but this one felt like it took no absolutely no effort and no thinking (and I'm not saying that in a I'm-so-good-this-game-was-easy-kind-of-way). I barely moved my ship throughout the game. Did I read somewhere that the space bar dropped bombs or something? If so, I didn't know it and never used it. I like the upgrade gimmick but the game itself wasn't challenging. Well, one more question for this screamer stuff. I'll definitely be prepared for it next time around, but... our faithful reviewer Tricky spoke of an other screamer before he found out the whereabouts of the heart rate one. I've got no idea what you guys are talking about, you know, the screamer. I had my sound pretty loud, and didn't see it coming, and I didn't even flinch. Play the game with all HUD modes on and options at their highest settings. Fully upgrade premium content then sit through the entire sheep shpeil (after the developer brings in his daughter(?)). Does anybody know how to get the "Real Estate" award? Buy every grid square on the ship upgrade screen. I finished this game out of frustration after crashing my browser completely the first time through, returning to find my nearly complete game had not been saved. It would have been fun had I not had to start over completely. There is a number code above the Boss' head which appears to read 17 9 11 5 1 2 15 19 19 , with some series of periods in between. Maybe this is just a secret message between developers? There is only one screamer. It comes after a slight delay after upgrading BPM. Since I had also upgraded some other things at the time, I confused cause and effect. I share your confusion. In the end, it's listed as Upgrade Completer at Armor Games, so I just went with that. It's not that I was even that startled by it, it's just that I don't see how the screamer's inclusion makes it a better game. Either you are startled by it which, you know, ha ha whatever, or you recognize what it is and have to wait while going "Oh... THIS again..."
A laser is your friend. A level five laser is a good friend. An army of lasers is your best friend. What that means is, don't use any weapon but lasers, maybe have some speed upgrades, and a few magnets, though. Lasers are the best weapon, since they can form a tight concentration of doom, or blanket an area in anhillation. SPK: The first number is 12. In the basic A=1 cipher it says "LIKE A BOSS". This is a cool game. More irritating, and more entertaining than its predecessor. But why is it that sometimes when I upgrade something, I prefer the way it was before! Why did the music degrade! Why did the dead pixels start appearing! And why did the background for the menu keep getting worse! Pretty fun game though. Why do dead pixels start appearing after dead pixels are upgraded? That's the opposite of what should happen, according to the text. The rest seems to work as intended, though. As to $#%^ing magnets and how they work? I think it's a miracle, like $#%^ing rainbows after it rains. Great game, excellent premium content. And what does the OCD upgrade do? Cool game. I haven't played it's predecessor so I can't compare the two, but I'm a fan of any break the 4th wall kind of games. I don't know if the game's designers are the type who check the JIG comments for suggestions for improvement, but I had one little thing bug me. Normally I'm not so nit-picky, but after completing the spelling/grammar update, "categories" was still spelled wrong on the upgrade menu. And thanks for the heads-up about the screamer. I hate those things and they scare me every time if I'm caught by surprise. I THINK that you have to watch it all the way through, after when his daughter or niece or granddaughter or whom ever starts talking. I'm not totally sure, but that's how i did it. The original Upgrade Complete was one of the greatest games on the internet (In my opinion), So I was dissapointed that I couldn't even play this game for fear of some idiotic face giving me a heart attack! Exactly how long does this screamer last for, because I'm gonna close my eyes when (or if) I purchase that upgrade. I am so OCD it's not funny, but I cannot figure out what the OCD upgrade did. Yes, I am obsessing over this, and by the time someone answers this I will probably have it figured out, but please answer anyway: WHAT DOES IT DO?!? first buy a bunch of of magnets with lasers and some rokets to win much money. get out. then, buy evry places and sell your magnets for anything but electic things try it to be equal with a bit more lasers. you should kill it easyly. Thanks for the review Tricky, you're too kind! As for the screamer, well, it was an April Fools day release, maybe one day I'll change it for a sad looking guy half heartedly saying Boo. Or maybe I'll keep that for the sequel so you can upgrade how scary the screamer gets :p .
For those of you who are ragging on the screamer, which by the way is incredibly tame by screamer standards. I'd just like to point out that the game warns you while loading that there is one in there, sure it doesn't say "Contains Screamer" but if you can claim to be any kind of gamer the threat is obvious, also a $1 upgrade called BPM that "Increases your heart rate"? I'll admit that ones a lot more vauge but it should at least trigger most peoples 'something is a bit off' senses. Yeesh.. Casual gamers. Achievement Unlocked "Totally saw it coming", add a bit on the end "From a mile away"
Ya know, I still haven't paid back my debt yet. Wonder how big it'll get in the 3rd version (if there is one). you must watch ALL of the premium content. That screamer wasn't all that great but it really did piss me off. I didn't get scared but my little cousin who was here watching me became terrified. Instantly closed the game and will never go back to it. Pretty stupid idea if you ask me. Ah - see.. I knew I'd feel a little foolish posting that comment. A cheeky refresh solved my problems, and the boss appeared immediately. Still a bit odd frankly. But oh well, problem solved. the screamer freaked me out,it was the worst thing on the internet,sure,there were a million others scary pics that jump up at you.but i dont mind them because they only stopped my heart(they are too scary),instead of making me run out of my room(damn that loud noise),the warning here is very nice,and Armor Games didnt include a warning(well a warning that is easy to see at least),which should be what make me angry the most,It ruined such a nice game and a game site,i am going to be scared if i ever dare to go on Armor Games again,i think they owe us a apology,you never know who plays games on what sites,and if they include a warning i am going to laugh at it,instead of screaming and so on,and now my legs still hurt from being shocked,if you are going to buy that upgrade,go mute your computer and enjoy a few seconds of flashing screens. @Evergreen They're Pokémon, not aliens. The boy is a Poliwhirl, and the girl is a Pikachu. Effect? Makes you go crazy searching up what it does when it does nothing. Fill every thing with rockets and magnets. And fly at the top of the screen. The OCD upgrade corrects a minor graphical error with the last HUD BG, on the right UPGRADE! button. You should be able to fill every available slot. Before the boss, just aim somewhere just above the top-middle laser. Think of yourself as a lawnmower in this respect. For the boss, just focus on it. For me, it went down before making its way fully on the screen. The 7 magnets make certain you don't miss cash. The lasers make certain stuff goes down fast. The 4 lightning is for satisfying my OCD habit of not wasting grid space. I realise everyone is scared to face the screamer, so there is a trick that might help. Go to google, and search for "Upgrade Complete heart rate upgrade". The first result in google images will be a picture of the screamer. It might help realizing it's really, really bad of a screamer. You can actually complete most of the game in what I call lazy mode, since the shooters, lightning and missiles attack automatically. You'll need magnets to collect the coins, of course; I got by with five but it did take me until level 30 before I could afford all the upgrades. Even with the ship almost fully upgraded with lightning and missiles it didn't seem to make much of a dent in the final boss, but a row of fully upgraded lasers soon saw him off. Pistols: cheapest of the weapons, at only $760 fully upgraded, but also the weakest of the weapons. Can be aimed in different directions so that you get a spread of fire instead of having them all shoot upwards, and also change direction briefly as you tilt while steering left or right. Your ship comes with a built-in fully upgraded pistol. Lasers: reasonable weapons, as they are only $1200 fully upgraded and only need four grid squares, so they are easy to build early on. However you need to combine them with other weapons otherwise you have to fly from side to side to ensure that you get all of the enemy ships, and you also need to fire them manually so they are no use in lazy mode. Lightning: expensive weapons, as they are $1960 fully upgraded. Also have the shortest range, but this can be alleviated by building them at the top of the grid. Building multiple level 1 lightning is more cost-effective than upgrading to level 5 until grid squares reach $66. Remember that lightning has a shorter range so place it as high up on the editor as you can. Missiles: expensive to buy, especially given the 16 grid squares necessary, but dirt cheap to upgrade, as they are only $900 fully upgraded. Only once grid squares reach $128 is it cheaper to buy lightning. Bombs: Never tried them, so I can't comment. Sorry about that. Magnets: Essential in lazy mode; the more the merrier. Cost is $520 fully upgraded. Boosters: Essential if you want to move up or down. Cost is $520 fully upgraded. You probably only need one of these. Foil: Useful if you have no magnets. Cost is $520 fully upgraded. Don't forget that your ship starts slightly to the left of centre so unless you have lightning or missiles you'll need to move to the right to find otherwise hidden enemy ships. After I had bought all the upgrades the main menu didn't seem to work, but I could access the upgrade screen and then I would exit to the screen that I was expecting. Although you need to have $120 available to buy magnets, boosters or foils, only $60 is deducted when you buy them. Similarly, lasers require $200 of funds but only deduct $150. There seems to be a bug in that if you upgrade the in-game music (as opposed to the menu music) to 2 out of 3 stars, then the game does not play correctly. The solution is to upgrade the in-game music to 3 stars. Upgrade the upgrade screen's politeness before you upgrade its opening and closing speed if you want the full effect.